Dubai: Digital transformation is such a positive move that companies shouldn’t bother with feasibility studies, delegates to the SP Jain School of Business’s Digital Transformation Conclave heard on Wednesday. But some firms cannot make needed changes, and a panel of experts from Microsoft, SAP, Oracle, IBM and Deloitte revealed why. Juan Jose De La Torre, IBM’s digital transformation leader for the UAE, said he found three major failings: a lack of understanding about what transformation really meant to a firm, unrealistic expectations, and a belief that there was an end to the process of transformation. Pedro Pereira, SAP’s UAE senior innovation and digital transformation lead, said he identified three qualities of successful transformers, and that lacking any one of them could doom a transformation bid to failure. The qualities he listed were humility, an acknowledgement from senior staff that they needed to learn; hunger, a real desire to transform to a digital model; and smarts — people smarts, he specified, the ability to engage people throughout the organisation. Amar Pandit, a UAE consultant with Deloitte, said everything hinged on top-level support, which brought agreement from his fellow panellists. Si Mohammad Saeed, Oracle’s regional head of marketing & digital, highlighted the success of Apparel group. Besides the need for strong leadership, the expert panel also agreed that companies should not focus on digitisation for its own sake, but have a clear idea of what they wanted to achieve. Oracle’s Saeed highlighted a recent IDC survey of Gulf Cooperative Council (GCC) firms that showed around 20 per cent of companies were ‘digital resisters’, who were not conducting any digital transformation, while 5 per cent were digital disrupters, and 5 per cent were ‘digital players’ — incremental transformers. 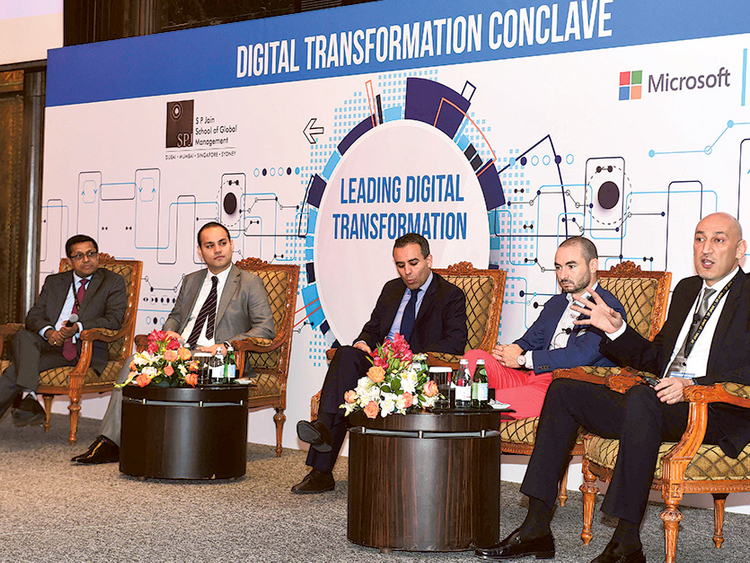 Mazen Fayed, Microsoft’s digital transformation lead in the UAE, said he saw digital transformation costs moving increasingly from capital expenditure to operating expenditure, and in future he expected a greater emphasis on value. Pereira said SAP saw digital transformation as a way for making organisations run better and improving people’s lives. “Digital transformation has provided the first part. The second part, improving people’s lives, is what’s coming,” he said.